What's your ambition? 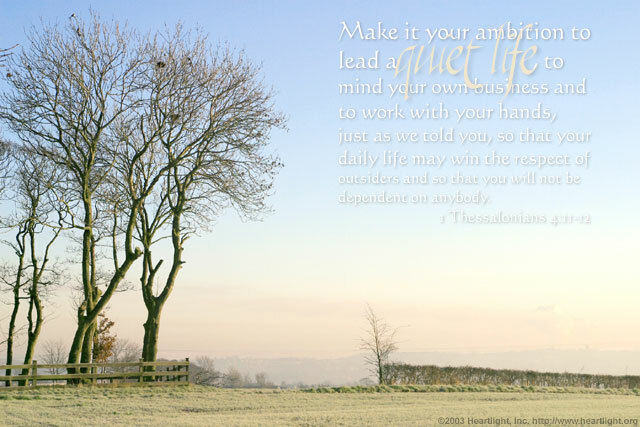 I don't know about you, but I'm not so sure I could say my ambition is to "live a quiet life ...." But when I hear the reason for that directive, I understand. So many people I meet are frazzled, run down, and exhausted with all their "busy-ness." So let's make a commitment to cycle down a little, trust God more and more each day, and seek to live a life that wins the respect of those around us! O precious and righteous Father, I need your help to learn to slow down and tend to my own responsibilities instead of running around out of control and without purpose. Please grant me not only the wisdom that I have been praying for, but also the patience and quietude that I need for that wisdom to change my heart and mind. In Jesus' name I ask it. Amen.